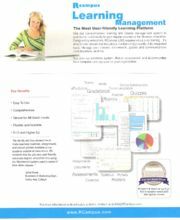 Learning Management System (LMS) is the practice of using computer software to organize and manage courses, course materials, students, grades, quizzes, and communications. They are usually web-based. LMS can be used as an add-on for a regular course, which allows for teachers to manage various aspects of teaching. It can also be used in distance learning or hybrid courses as the primary means of communication among teachers and students. RCampus Learning Management System is a web-based software system designed to facilitate the management of courses for faculty and students, especially by helping teachers and learners with course administration. The system can track the students' progress, which can be monitored by both teachers and students. RCampus LMS is available to schools (see our licensing and hosting / outsourcing options). Its tools are available instantly to teachers and students at www.RCampus.com. Our tools are designed to be easy-to-use, quick to set-up and highly secure. Course: A course refers to a specific subject of study, such as Basic Algebra, from which classes are offered. Class: A class is a single offering of a course. Faculty websites - Lists your courses on your website automatically. Faculty online groups - Collaborate with others. Rubrics - Use rubrics for assessment. ePortfolios - Assign Student ePortfolios for recording the learning process and demonstrating the learning outcome.